Egyptian-inspired unique 2-strand choker with woven seed bead copper pendant. Bonnie Mincu design. 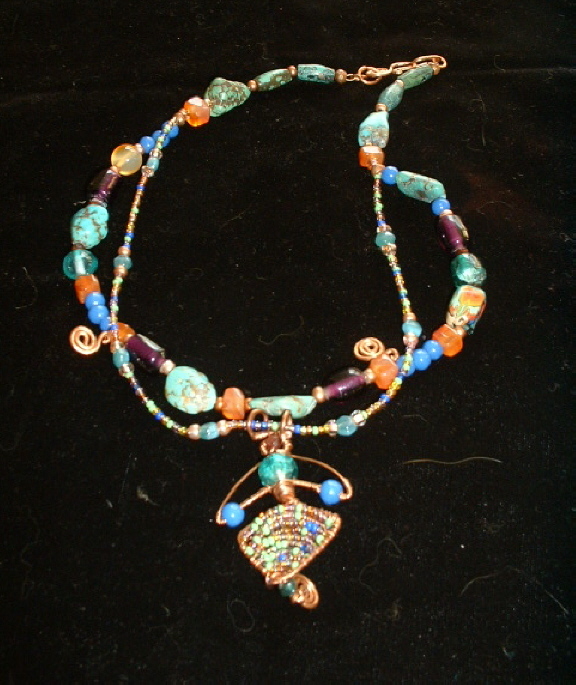 Ancient Egyptian jewelry of turquoise and blue with gold inspired the colors in this copper necklace. Unique pendant features tiny beads woven across a copper frame. Double-strand necklace of turquoise, carnelian, glass and copper. Beautiful patterned polymer bead of orange and blues. Absolutely unique, one-of-a-kind design by Bonnie Mincu. Contact Bonnie Mincu about this necklace.